I’ve knit this pattern once before, but I appreciated the brilliance of it more the second time around. The knitted edge around the base of the bag is simple to do, but is ideal for adding a bit of extra stability to the base of the bag. There’s also a section at the top of the bag where you add purl bumps that identify where to knit and attach the I-cord handles. The designer thought of everything. 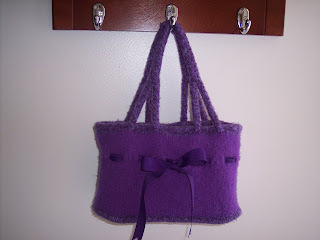 If you’re looking for a great felted bag for either yourself or a young girl, I give this one a huge thumbs up! I did a bit of stash enhancement the last few days. I placed an order with Knit Picks for needles and skeins of their new sock yarn, Felici, and Risata. I also lucked out on a closeout sale of Artyarns Supermerino at Yarn4Socks.com and then helped Lain with her de-stash by purchasing some sock yarn and and such too. I’ve been itching to also get some yarn at Blue Moon Fiber Arts, but I’m having a horrible time deciding between all the new colors they just released. Thankfully The Loopy Ewe hasn’t updated recently (as of this writing), otherwise I’d really be broke! And just in case you’re wondering, the sock design classes I took from Cookie yesterday were absolutely wonderful, and I’ll try to get a post written up in the next day or two. I should’ve posted about this at the end of December, or at least January, but it slipped through the cracks! This project was finished the 2nd week of December but deserves its own post, so I’d like to introduce…..
Notes: Early last year my neice (pictured) asked me to knit her a bag for her birthday that she could put her scriptures in. I thought this request was interesting and ironic, (but only those of you who know my past will understand why). My little sister and I scoured the internet to find something that might work and when we ran across this pattern, we crossed our fingers and I purchased it. The pattern was clearly written, clever, and a quick knit. Since almost everyone I know has knit with Cascade 220, I don’t have to tell you how good it is. The base of the purse is sturdy, but I added some plastic canvas for extra stiffness since the scriptures being held weigh about 3 pounds. It worked out perfectly! The only thing that would’ve made this better, would be a lining with a small zippered pocket to hold some paper and a pencil. Otherwise, it’s perfect! In CURRENT knitting news, Pomatomus are blocking, I’ve started Zephyr Socks, and at Karen‘s request, I’ve included a photo of my Clapotis in progress. The colorway is so not “me”, but I’m actually starting to like it. I remarked to DH last night that I had nothing in my wardrobe that would match this (since he picked out the yarn). I fully expected him to give me one of those “looks”, but instead he said, “I guess I’ll have to buy you something”. Did I marry the perfect man or what?